I always enjoy sitting upstairs at one of the tables near the wall of glass windows inside The Strand House. I gaze out at the Manhattan Beach Pier and Pacific Ocean watching pelicans soar along the shore line. My blood pressure lowers and I gain a sense of well-being. I met with Heath Gregory, partner of The Strand House and co-founder of Tour de Pier to learn about his second annual Tour de Pier fundraiser on May 18, 2014. Gregory’s fundraiser is to raise funds for cancer research and support. The three charities that will benefit from this event are The Hirshberg Foundation for Pancreatic Cancer Research, Cancer Support Community and Livestrong Foundation. Michael Zislis, Heath Gregory and chefs Greg Hozinsky and Austin Cobb created a special antioxidant and cancer fighting menu for the Tour de Pier event. On May 1 to May 18 come have lunch at The Strand House and a portion of the proceeds will be donated to Tour de Pier fundraising efforts. The Tour de Pier charity event takes place outdoors on 300 stationary cycling bikes lined up along The Strand below the restaurant and on the pier. The South Bay’s best instructors and celebrity guests will spin riders through a four-hour session with great music and excitement motivating their legs to pedal. One of the celebrities is Olympic Cyclist Antonio “Tony” Cruz. I had the opportunity to chat with Cruz during lunch. He told me that at the age of 12 his father encouraged him to enter his first cycle race in Manhattan Beach. When he hit the finish line, Cruz was hooked. We talked while enjoying a Kale salad with sliced red grapes, candied pumpkin seeds, goat cheese and faro. I learned that Kale is high in fiber and has zero fat. It’s high in vitamin K, A and C. Studies have shown that Vitamin K helps against various cancers. It has shown a slow down and even stops a tumors growth when taken as a supplement. Kale can lower cholesterol and is a high calcium detox food. Cruz became a professional road bicycle racer from the United States. From 2000 to 2009 he rode on the US Postal Service team with Lance Armstrong. He also has been on the Discovery Channel Pro Cycling Team and the BMC Racing Team. “I had 22 friends and family members come to many of my events,” said Cruz. “Their smiling faces and encouragement kept me going.” He owes so much gratitude to his mother and father. They have supported every spin he has made. Next we all enjoyed a hamachi crude with lovely slices of avocado with a drizzle of tomato seed vinaigrette and red alaea sea salt. Avocados are known as a great cancer fighting food. They are high in lutein and has been shown to lower rates in breast cancer. They are rich in nutrients, antioxidants, vitamins, minerals, fiber and healthy monounsaturated fats. Red alaea sea salt is a product from Hawaii that offers healthy minerals, electrolytes and digestible dietary iron. 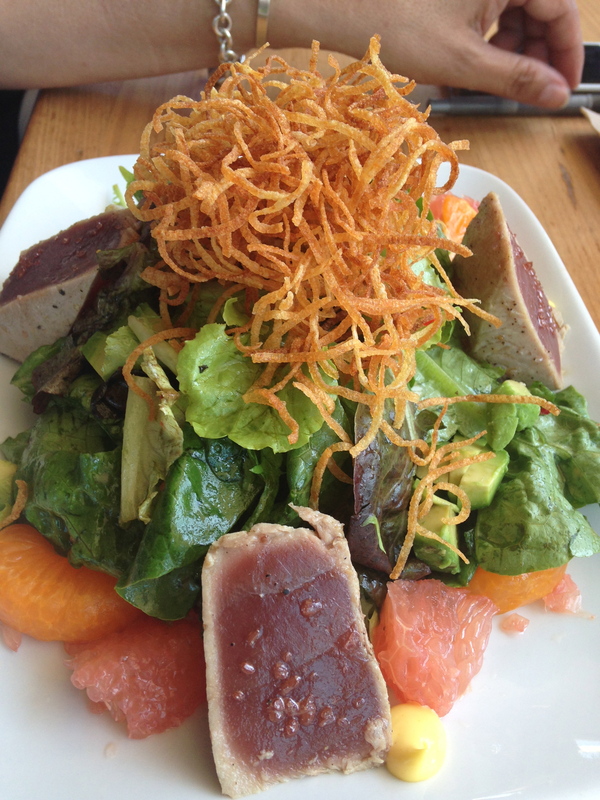 We also ate a citrus Ahi tuna salad, because Ahi is densely packed with B vitamins and vitamins that help maintain a healthy immune system. These vitamins are beneficial for digestion, metabolism, healthy skin and neurological functions. Another salad that The Strand House serves is the raw salad filled with asparagus, broccolini, raw cashews, greens, carrots and a herb vinaigrette. Asparagus is a good source of fiber, folate and Vitamins A, C, E, and K. It helps break down carcinogens and harmful compounds. Eating asparagus has been known to help protect against and fight certain forms of bone, breast and colon cancer. To participate in the Tour de Pier – the registration fee per rider is $125. Each bike team must raise a minimum of $500. The registration fee will count towards the $500. The deadline is May 4. Riders can ride a bike for four hours or share the bike with team members. Check in is May 18 at 7:30 a.m. The event takes place from 9 a.m. to 1 p.m. at Manhattan Ave. and 10th Street at the pier and The Strand. Last year they raised $339,000 for local charities. Please visit www.tourdepier.com. On the day of the event, there will be a Health & Fitness Expo and Kid’s Fun Zone with games, activities and entertainment. 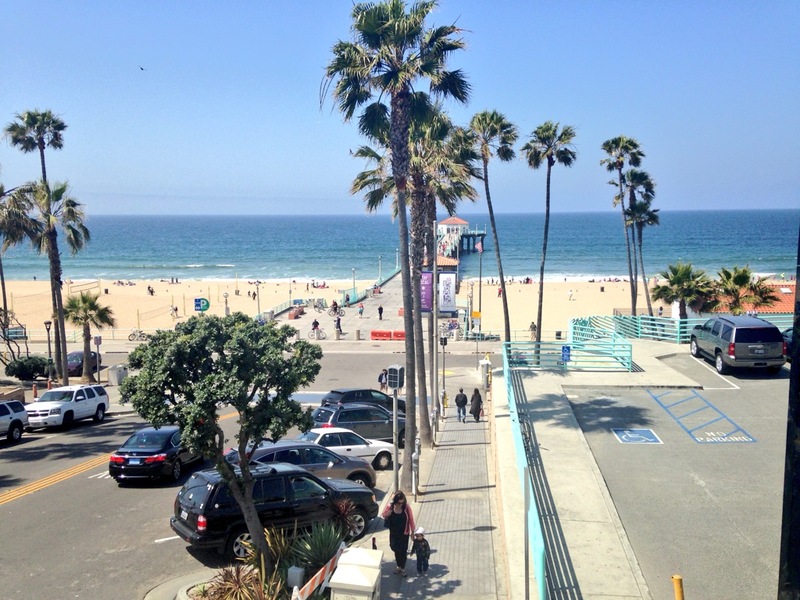 The Strand House is located at 117 Manhattan Beach Blvd, Manhattan Beach, CA 90266. 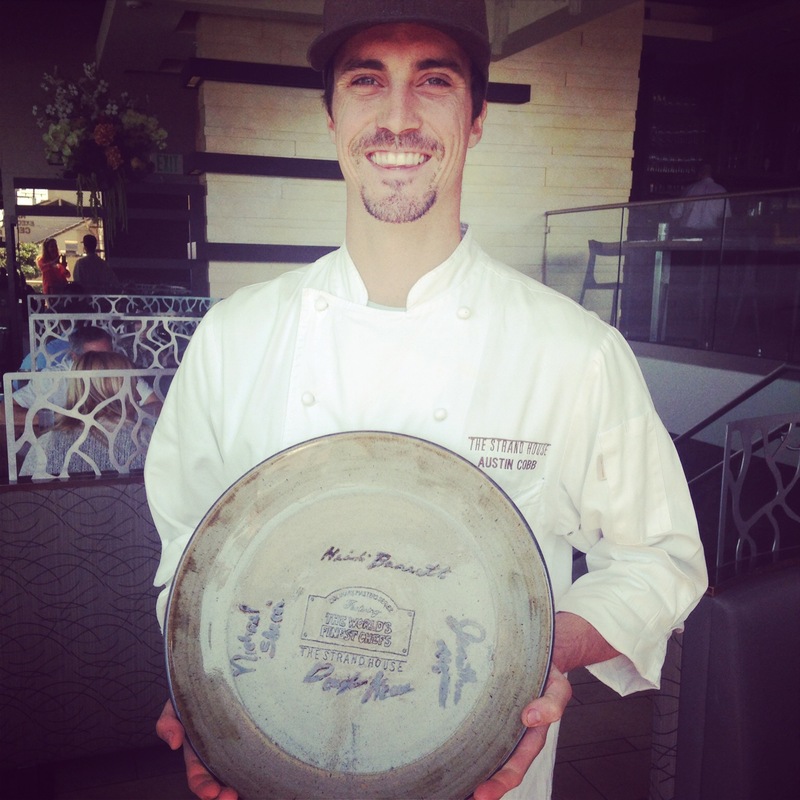 1 For reservations, visit The Strand House page on OpenTable or call (310) 545-7470. The Hirshberg Foundation of Pancreatic Cancer Research is a national, nonprofit organization dedicated to advancing pancreatic cancer research. For more information, go to www.pancreatic.org. Livestrong Foundation provides support to guide people through the cancer experience, bringing them together to fight cancer and work for a world in which the fight is no longer necessary. For more information, visit www.livestrong.org. The Cancer Support Community Redondo Beach offers a free program for cancer patients, their families and loved ones. Visit www.cancersupportredondobeach.org.